Politicians fume at PA's 'war crimes' accusations; even leftist MKs say 'true peace lovers' should reject Abbas mudslinging. MKs from across the political spectrum have begun to react to Palestinian Authority (PA) Chairman Mahmoud Abbas's incitement-laced speech against Israel at the UN General Assembly Saturday, after he accused Israel of "war crimes" and "genocide" for protecting itself during Operation Protective Edge in Gaza. "Mahmoud Abbas has again proved his only expertise is spreading lies and incitement against Israel," Communications Minister Gilad Erdan (Likud) slammed Saturday night. "He has denied the Holocaust in the past and now, in this surreal speech at the UN, he has accused us of 'genocide.'" "This is not how a 'peace partner' talks, and certainly not anyone who wants for 'reconciliation between peoples," Erdan continued. "Now it is clear why he insists on partnering with the Hamas terrorist organization, with whom he shares the 'struggle against Israel' and will promote our delegitimization through false propaganda." "Mahmoud Abbas always finds a soft spot for murderers, rocket launchers, and our enemies in general," Jewish Home Chairman and Economics Minister Naftali Bennett added. "We saw missiles launched at Ben Gurion Airport two months ago, and it's good to know these launchers are members of Mahmoud Abbas's 'Palestinian state.'" "Now Israel must find new and creative ways to allow us to just survive here," Bennett fumed. "A Palestinian state west of the Jordan River is not one of them." Even the extreme left took issue with Abbas's speech. "While Israel has acted harshly in Gaza and made ​​things difficult [for the Palestinians], you cannot call it 'genocide," Meretz Chairman Zahava Gal-On stated Saturday. Gal-On - who did not explicitly condemn Abbas - did add, however, that Abbas's words were "serious and grave." "These are false and outrageous statements," MK Eitan Cabel (Labor), added. "It would have been better if they had not spoken, and these words are worthy of condemnation from all who truly love peace." 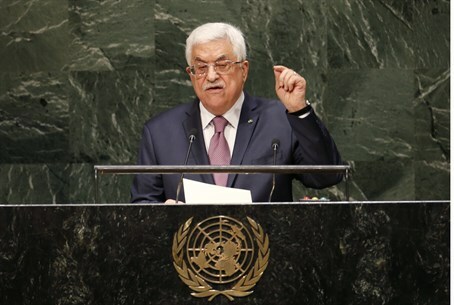 "Even if he [Abbas] has domestic political needs which require him to 'wink at' Hamas, there is no justification for such statements," Cabel continued. "The people of Israel, who aspires to real peace, cannot accept them."